A scene from “American Rhythm” at Lambs Players Theatre. Too much – and too little. That always seems to be the problem with musical survey shows – at which Lamb’s Players Theatre excels. In the updated return of “American Rhythm: 100 Years of Amazing Music” (presented in 2000 and 2007), some songs and singers get surprisingly short shrift (just one line for Springsteen?) and others get the full-number treatment (“Stardust Melody” and “Bye Bye Blackbird,” for example, though these renditions are worth it). Some icons get no time at all (what happened to Janis? Jimmy? Barbra? The Four Seasons?). Then, in an effort to cram in ten decades worth of (selected) material, these efforts do go on (this one lasts nearly three hours). There’s a bit of anachronism, too; “Can’t Help Lovin’ Dat Man” (wonderfully sung by Kiana Bell) appears in the WWII segment, but it’s one of the best-known songs from Kern and Hammerstein’s “Show Boat,” which premiered in 1927! Clearly, there will never be consensus on the choices, the omissions or the length of such ventures. You just have to accept and enjoy. Or, if this type of endeavor is not your cup of entertainment, sip and sup elsewhere. But no one does this better than Lamb’s. Original co-creator Vanda Eggington, long gone from San Diego, returned to refresh the piece she developed 16 years ago with Lambs associate artistic director Kerry Meads (who directed the show). They moved it from the initial intention — music of the 20th century — to the last 100 years (so, like Lamb’s perennial holiday show, “An American Christmas,” they can continue to update it). While the musical reminiscences still begin at the turn of the 20th century and highlight uniquely American styles such as ragtime, swing, jazz, gospel and barbershop quartet, there’s also room for Britney, Beyoncé and Pharell — but no space for imports like The Beatles or Stones. The original multi-level set (by Mike Buckley) has added bright LED framing lights and a screen for archival projections (Blake McCarty), which furnish the only dark element in this otherwise sunny, highly patriotic presentation. Those films and stills give us riots and Rodney King, the battlefields of Vietnam and many of the not-so-savory moments of our last century, which can’t be ignored. Before we get to the mega-talented cast (some of whom accompany themselves on piano or guitar), let’s pay homage to the costumes. 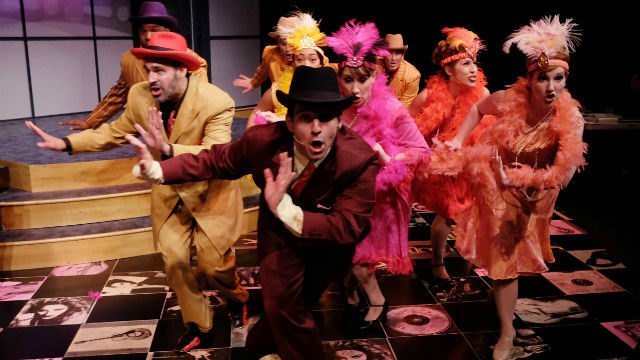 Jeanne Reith admits that the zoot suits came from the last production, but all the rest of the 900 individual pieces (including hats, ties and jewelry) for some 100 outfits for these ten performers, are newly created. Some of the costume/wig/style changes are lightning — fast, and one can barely imagine the well-managed mayhem that must be going on backstage. The wide-ranging musical styles are sublimely captured by a crackerjack band — seven pieces that seem like 17 (Rik Ogden is a one-man-band on his own, with his guitar, banjo and various reed instruments), under the baton of keyboardist Andy Ingersoll. They’re called on for singing backup — and even solos. Terrific work. Colleen Kollar Smith has outdone herself on the choreography, making great use of the space and the costumes to convey the physical joy of much of the music. There’s only one real dancer in the company: the amazingly agile, gifted Siri Hafso, a knockout who also sings up a storm (her “Fever” really sizzles). Lance Arthur Smith (Kollar Smith’s husband), as our ever-evolving, newspaper-wielding narrator/guide, barely gets to display his prodigious terpsichorean talents. But everyone gamely gets into the dancing act, and the results are energetic and enthusiastic. Director Meads finds a way to spotlight the special skills of each performer: Kiana Bell’s jazzy blues and gospel; Sandy Campbell’s heartfelt ballads; Joy Yandell’s killer country twang (someone should cast her as Patsy Cline pronto! ); Benjamin Roy, as potent with bluesy numbers as with hip hop; David S. Humphrey, putting over soulful numbers and cheesy lounge music — and Elvis! and David Byrne! ); Caitie Grady, both funny and dramatic (“I’ll Be Seeing You” is a real tear-jerker); Luke Harvey Jacobs captures signature singer/songwriters like Dylan and John Denver; Michael Cusimano, recently seen as Riff Raff in Cygnet’s “Rocky Horror Show,” shows more of his dancing than his rocker persona. The musical arrangements (Meads and Eggington) are often stunning, including superbly layered harmonies and gorgeous a capella numbers. The pair has also built a few mini-dramas into the mix, moments of heartache that give us a deeper sense of character and history: during the Depression, the Dust Bowl and the aftermath of WWII. These, like Lance Smith’s enumerative updates (Look how far we’ve come!) break up the feeling of one long medley, though some of the song excerpt linkages are quite clever. There’s so much to savor here that the inherent weaknesses of the form get submerged in the ebullience, which underscores the notion that music marks our lives, our times, our memories and our emotions. Running Time: 2 hrs. 50 min.